It’s hard to say when cousins Joey Darragh and Tony Giordano first dreamed up the idea of co-founding a brewery together. And yet, so many of their life decisions revolved around answering two questions: How do we craft a unique brewery identity and do we have what it takes to build a long-lasting business in the bustling beer biz? Joey was drinking in the West Coast IPA scene while working for Tesla in California, researching beer industry trends and growth patterns in his free time. Tony rose from the packaging line at Colorado’s award-winning Boulder Beer Company to become its cask manager and brewer. All signs pointed to powerful possibilities for the cousins. We’re about to explore a project that’s still underway, following the creative process—from idea to execution. 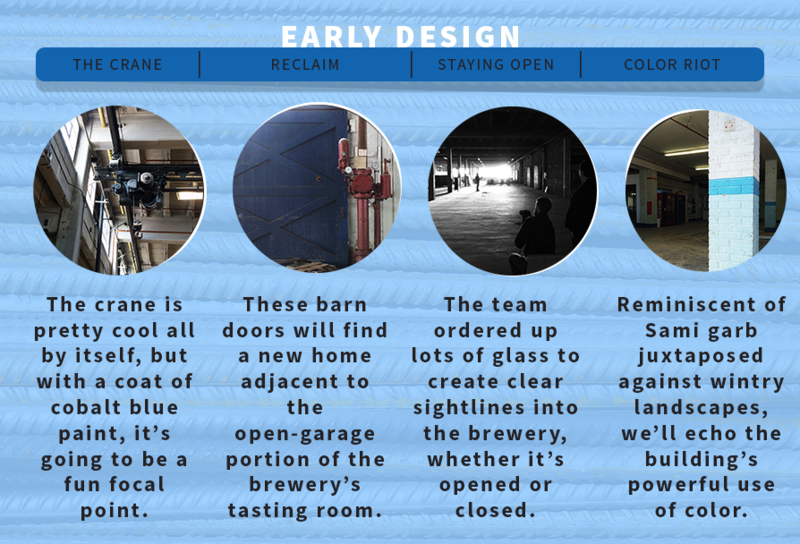 So, fair warning: Change may happen between now and what you’ll see when the brewery opens in early 2017. This is not a tale about an average client/business partner relationship. This is a story about people who love to make beer working with people who love to drink beer, and what happens when they design for people who share those sentiments. Indeed, the northernmost indigenous people of Europe are the Sami, also known as the Laplanders. The Sami people are innately attuned to the land, it’s their livelihood; they are coastal fishers, trappers and sheep herders, among other professions. The more the cousins researched the Sami, the more moved they became. 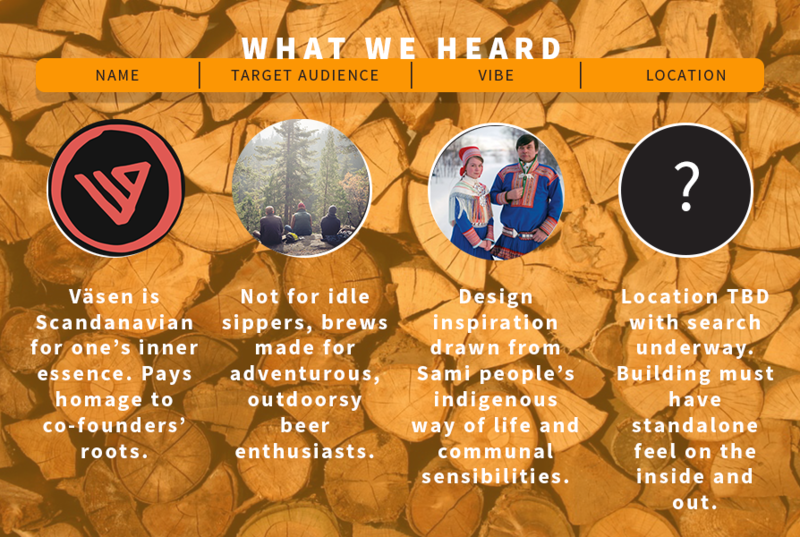 Väsen Brewing Company (complete with German umlauts) was born from the many parallels between the cousins’ desire to create a brewery that celebrates the relationship between people and the outdoors with the Sami’s rustic way of living and strong reverence for family and community. Joey and Tony shared Väsen’s Pinterest page, so she and other design team members could really understand what inspired the duo while they searched for a building worthy of their grand ambitions. The band got back together in August of 2016 to officially start design work, after securing space in the historic HandCraft building. When Gillian learned Väsen had its sights set on opening shop in Scott’s Addition, a neighborhood overflowing with stout competition, she knew another key component of the design would be highlighting the building’s existing features. Gillian became Väsen’s extraction expert, harnessing the heart and soul of their inspirations into compelling features for their physical space. “She’s our cheerleader,” said Tony about Gillian. “She might be the most excited person about this brewery,” he grinned. chandelier painted cobalt blue, perfectly plaid chairs and a ginormous fireplace. And while the design was perfect for the hostel, Gillian knew it wasn’t the rustic and humble look Väsen was going for. After digging deeper—more picture exchanges, more conversations and more beer tastings—the design team honed in on the cousin’s affinity for natural elements and their imperfections, and bright colors. The foundation of a design with outdoors-level durability was set. The last thing anyone associated with Väsen wants patrons to feel is constrained or cramped. That’s why the Väsen crew was giddy over how open the property is and the amount of natural light that pours in. This is a space where people can stretch their legs, roam and enjoy some brews. There’s ample parking, room for a wicked outdoor patio and the high-bay capabilities brewers crave. “From an architectural standpoint, the art deco look of our building is unique for the neighborhood,” said Jon Warner, Ph.D. and Väsen’s head brewery scientist. A rust-colored trim pops off the stark white building, complementing its playful curvatures and numerous geometric shapes—and the property’s rich history. Joey likened entering the nearly 17,000 SF of space to approaching Jurassic Park’s towering wooden doors, and being overcome with a rush of grandiose and mystery. 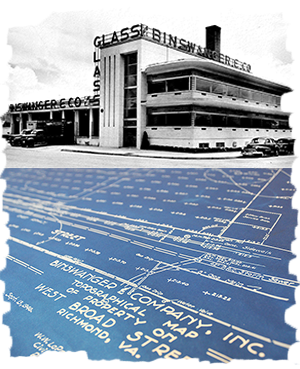 Originally designed by Baskervill in 1946 for Binswanger Glass Co., the space included massive doors to accommodate the large pieces of glass coming and going from adjacent trains. Today, locals know the property as the HandCraft building, named after the family-owned-and-operated cleaning business that has occupied the space since 1983. The team’s early design work (aka schematic design) focused on cost-effective ideas to highlight the building’s existing features while staying true to Väsen’s affinity for nature, simplicity and color. That’s why the space’s sturdy concrete floors are staying put. Instead of hiding minor cracks and weathered spots, a carefully selected stain will add an earthy tone to the durable material ready for heavy foot traffic. Väsen’s epicenter, its nearly 2,700-SF tasting room, is meant to feel more like hitting up a favorite mountain trail or spending time in a cozy cabin, than average bar. 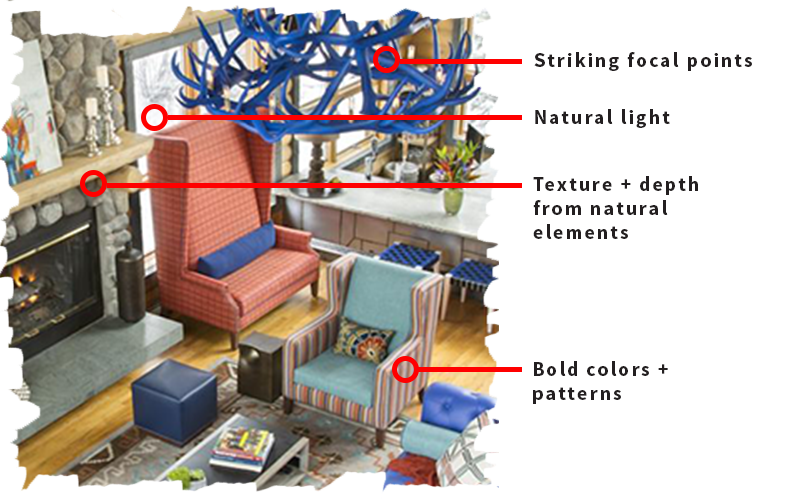 This is where our design team focused its efforts and was challenged by the co-founders to deliver adventurous delights that are equally functional and eye appealing. Because in the great outdoors, you only take what you need, right? A colorful statement wall of blankets with Nordic patterns isn’t just eye candy—they’re available for visitors to use in the open and airy space. And since it’s super important to stay hydrated in the great outdoors, there’s a self-service watering station to “fill up your Nalgenes,” added Gillian. First, check out your drink options from a trail-sign inspired menu made from reclaimed wood. Maybe you’ll stick close to the oak live edge bar, or you’ll enjoy Väsen’s liquid assets after climbing to your favorite peak on their indoor rockscape. Where the design team excelled was in offering up detailed finishes to complement the cousin’s grand ideas. Custom charging stations and stowaway spaces at the bar encourage people to put down their phones and connect with their surroundings and each other. Even the inward-facing orientation of chairs encourages the communal vibe, making it easy for patrons to chat up those around them. A centrally-located projector offers up a spot for shared experiences. 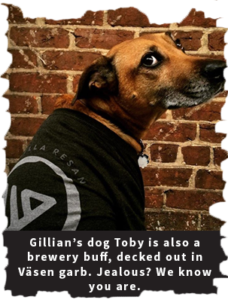 “Every time we walked into a Baskervill conference room for a meeting, Gillian was there with a huge smile on her face, clearly super eager to show us what she had worked on for us and to continue brainstorming new ideas,” said Joey. “Her excitement was contagious and we found ourselves leaving our meetings with her filled with new energy for the project.” Gillian even assisted with Väsen’s branding and color palette. 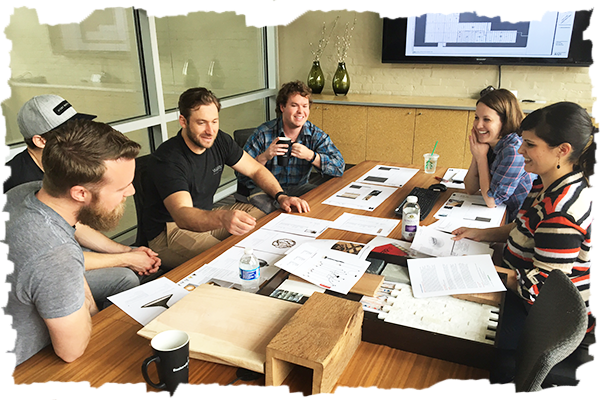 It’s hard to convey just how much ground the group covered together, from messy conversations to inside jokes and finishing each other’s sentences at a design meeting where floor plans, fixtures and furnishings were discussed at length. If you could sit on the sidelines of this story and watch this group interact (as the author of this article did), you’d be taken aback. You’d be unable to resist a feeling of forward progress, fresh approaches and fun—these meetings were so fun. Joey and Tony would sit silently as Gillian presented the final design ideas. After a round of questions were asked and the next set of action items were determined, one co-founder would lean back, pat the other on the shoulder and chime in with a carefree expression: “We’re along for the ride.” Tony tapped his foot to the ground, leaning back in his chair comfortably. Joey occasionally stroked the full beard he sports. It was evident that every decision mattered, and the desire to offer up something new and exciting to customers hung in the air. Gillian hit the final slide of her presentation, where she comically superimposed the whole Väsen team into the rendering of their tasting room. Everyone broke out in rambunctious laughter; there may have been tiny tears. The group had conquered endless possibilities and landed on something finite—a foundation that Väsen can confidently build upon when they get up and running. Showing is more powerful than telling. Visual aids are always best. Have a vision, but trust others and allow them to do their job. If you have an idea, start early and deeply explore your options. Check back with us in 2017, when we’ll celebrate the new year with posting up finished photos from this neat project. Until then, go get ‘em Väsen!